Hello, friends, how goes your week? Honestly, I’m still catching up from being at Mid-winter last week. We took the grandparents to the airport last night and my girl woke up this morning with a stomach bug. I’m praising God that she is pretty self-sufficient, even when sick, so I can spend some time alone in the yellow chair in my office working, planning and most of all praying. This got me thinking about the Well Being Quadrant we looked at during our Mid-Winter discussion group. We will talk more about all four quadrants in the coming weeks but one of the quadrants is Daily Happiness. Upon hearing about daily happiness as being part of the well-being quadrants I balked at it. Happiness feels like a cheap word at times. “Do what makes you happy” is a phrase we hear culture say often which weakens its meaning for me. Because, after all, aren’t we supposed to be focusing on the Joy of the Lord? We esteem seeking joy over happiness. But the more I think about it the more I think I’m on board. Daily happiness is a bit of a monitoring system for our overall well-being. If I can look at my day-to-day life and say to myself “yeah, I have a pretty good life”, then I know my general well-being is in a good place. This idea of Daily Happiness has a real physical component for me. Being a homebody, my physical space is really important to me. I want to feel cozy and comfortable in my space. As you can imagine the Scandinavian idea of hygge is highly relatable to me. This includes my slippers. We have been preparing for some serious cold here in the Midwest. School and church activities have officially been cancelled for Wednesday and we are looking forward to a day of cozy indoor activities. I found myself wandering around my kitchen this morning though, a little lost. I couldn’t quite settle myself. I wasn’t hungry, I had finished all the coffee I dare to drink in a given day, my girl was situated and feeling better, but I still felt unsettled. And then it dawned on me… my feet were cold. Every step I took through-out my house made my feet uncomfortable and my mind fidgety. But once I put slippers on my feet I felt more at ease and, with this simple body need taken care of, more focused. 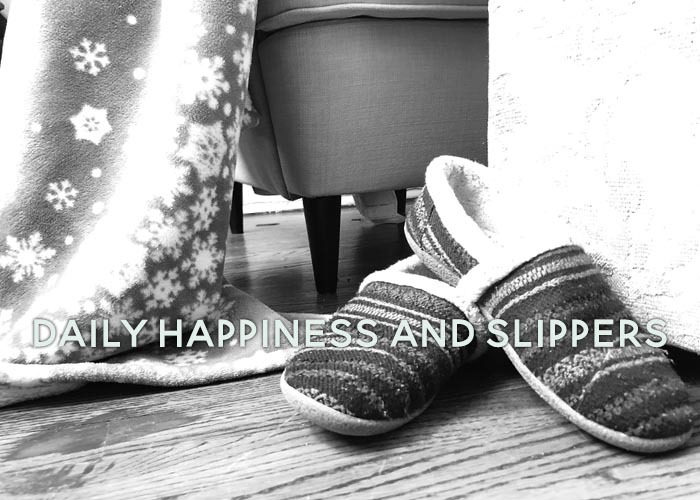 Today, my slippers contributed to my daily happiness and therefore to my sense of well-being. It seems like a fairly trivial thing, but I don’t believe it is without significance. So, friends, what is contributing to your daily happiness today? This week? Do you also balk at the idea of happiness in light of Joy? Are joy and happiness the same thing for you? Are you too busy to find daily happiness? I’d love to hear your thoughts. Leave a comment below or head back to our private Facebook group to comment.